I recently did an in-depth study of more than 300 emails sent in the final 48 hours of affiliate promotions by nearly 40 top marketers. These are people that you would know and recognize. And I read through every single one of their end-of-promotion emails…whew! When I combined what I learned from this research with what my team and I have learned from our own experience promoting affiliate offers, I discovered five secrets. When we implemented these five secrets and followed what we’d learned, our results improved dramatically! In any given launch, if you look at the top 10 affiliates, there will always be 3 or 4 of them that will convert 2-5x better than the rest of the top 10. In other words, a few affiliates convert a higher percentage of their leads into sales than the others. Even amongst the top 10 affiliates. What this means is you might 3 or 4 affiliates who convert 5-10% of leads into sales, while the rest of the top 10 converts 1-3%. It happens every single launch and I always wondered why. So I dug in. So what is it that these top affiliates are doing, and how can you apply it to YOUR emails? Without fail, this secret has the BIGGEST impact on your affiliate sales. The top marketers email an average of 5.3 times in the last 48 hours of an affiliate launch, compared to only 1.8 times for everyone else. But here’s the thing, it WILL make you more sales with very little negative impact. I’ve proven it with my own email list. When I saw those numbers for the first time, we immediately began emailing five times in the last 48 hours…and we’ve since increased it during some promotions. Later I thought if five emails works so well, what would happen if we sent TEN emails on cart close day? Well, that “crazy” thought led to us finishing 3rd in a huge affiliate promotion, winning more than $30,000 in commissions and prizes and beating out affiliates with lists 10-15x larger than ours! And I only had ONE person unsubscribe. I sent TEN emails in a single day and only had ONE person unsubscribe. Not only that, I often have people send me emails to THANK me for sending multiple emails toward the end of a promotion. They tell me that they missed the earlier emails or had gotten busy and were grateful for the reminder. Secrets 3 and 4 below are a big part of the reason we only had one unsubscribe, so keep reading to learn all five email marketing secrets! But for now…just know that the biggest key to more affiliate sales is sending more emails on cart close day. Not only do the top marketers send a lot of emails, but the emails they send are usually shorter than other affiliates’ emails. Through studying the 300+ emails, I found that the average length of the end-of-promotion emails from top converters was only 132 words, compared to 203 words for everyone else. And 27% of the top-converting emails were less than 100 words long. The key to your emails in the final 48 hours is to keep them short and sweet. Your only goal at that point is to get them to click through to the sales page or your bonuses page. 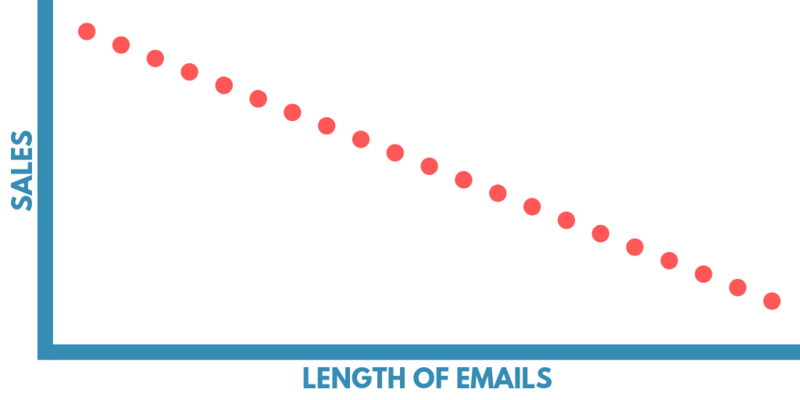 Focus on keeping them shorter than your average email length. For you, that might be in the 75-100 word range. If you typically write longer emails, “short” for you might be 200-250 words. The key is to try much shorter emails in the last 48 hours of a promotion and see what works for your audience. One of the reasons that I am able to mail my list 5+ times on cart close day is because I use my optin list. An optin list is the list of people who have opted into any of the free pre-launch content that has been offered prior to the cart opening. You can get your optin list simply by asking the affiliate manager for it. If they are any good at their job, they’ll gladly share it with you…because they know you’ll promote more! If you want to learn how to best use your optin list, listen to this podcast episode. I share some of the key ways you can use your optin list to close more sales once the cart opens. The reason this strategy works so well is that you are focusing on the people who have raised their hand and expressed interest in the topic you are promoting. These are your most engaged, warmed up prospects. If a person has entered their email and expressed interest in the topic, they are very unlikely to unsubscribe when you email them about that same topic. Word of Caution: Remember, you can only email people who have signed up for your list. Your optin list may include people who opted in through social media or other places, but you can only email them if they are on your email list. The best way to make sure you handle your optin list correctly is to create a segment/tag of your email list and copy/paste the optin list into it. That will automatically remove anyone who is not subscribed to your list. This is the second strategy that allows us to easily email 5-10 times in a single day for an affiliate promotion with no downside. We allow our audience to opt out of just that promotion. Not interested in learning about how to launch your product? Click Here and I won’t share any more about Jeff Walker’s Product Launch Formula with you…but I’ll make sure you still get my super awesome affiliate marketing info. When someone clicked on the words “Click Here” they were tagged as “out” for that promotion in our email system and they didn’t get any more emails about it…but they were still on my email list and still got my regular emails. Almost any email system (MailChimp, ConvertKit, you name it) will allow you to do this. Using this strategy has been a game-changer for us and it will be for you too! As the email frequency increases, admittedly our ability to come up with great content decreases. In the promotion in which we sent 10 emails on the final day, two of those emails were “forwarded” from the product creator. This requires you to pay attention to those emails (which means you should be opted in yourself!). Let’s say that during the afternoon of cart close day, the product creator sends an email announcing a new, exciting bonus. This is a great opportunity to email your list to make sure they see this email and to really play up this new bonus. Sure, you could just send an email to them telling them about it, but it’s a great pattern disrupt to forward an email to them from the course creator. I just wanted to make sure you saw this email from [COURSE CREATOR] announcing his NEW BONUS! See all the bonuses and enroll here [YOUR LINK]. Copy the email you received. Paste it into a plain text editor (to remove any weird formatting your email system might add). Insert it into an HTML editor or whatever you use to write your emails. Add the “forwarded message info” – the From, Date, Subject, and To lines . Add your personal intro. message above the forwarded email. BOOM! You have a great email that gets opened and gets results. And it takes you a fraction of the time it would take to write an entire email from scratch! First, don’t overuse this strategy. We only use it once every 2 or 3 launches. If you overuse it, it loses its effectiveness. Third…and this is MOST IMPORTANT. Make sure you change the links in the original email to YOUR affiliate link when you forward the email. Never forward an email without changing the links…or you’ll get no credit for the sale! Bottom line: If you will use these 5 email marketing secrets you WILL close more affiliate sales, regardless of your email list size. Matt McWilliams is an affiliate/JV manager, consultant, and online entrepreneur who regularly posts at mattmcwilliams.com.